Vauxhall/Opel have released the first the first images of the 2012 Insignia, prior to its launch next month at IAA. The 2012 Insignia has received minor adjustments, mainly mechanically. On the outside, redesigned alloy wheels and a new metallic paint called “Luxor” has debuted. Inside, a pair of new infotainment systems, which are described as “are far superior to the CD or DVD-based predecessor versions in terms of the scope of features offered”, store all their map data on SD cards for simple updating and a new Nappa leather seating is available. Technically, the front-facing camera now features “Forward Collision Alert” system, which informs the driver of a possible collision with the car in front. Mechanically, engines have been tweaked to provide lower running costs and enhanced performance. The brand's turbocharged 1.4 litre ecoFLEX petrol units succeeds the previous naturally-aspirated 1.8 litre that produces 138bhp (140PS/103kW) and 200Nm (147lb-ft) of torque. A 6-speed manual gearbox, electric power steering, stop-start, 17” alloy wheels with low resistance tyres, and a new aerodynamic underbody will ensure carbon emissions of 134g/km (139g/km for Sports Tourer) and combined fuel economy of 49.5mpg (5.7/100km) (47.8mpg/5.9/100km for Sports Tourer). The turbocharged 2.0 litre with all-wheel-drive now kicks-out 248bhp (250PS/185kW) and 400Nm (295lb-ft) of torque, a 30bhp (30PS/22kW) and 50Nm (37lb-ft) improvement. Like the smaller 1.4T, a stop-start system has been fitted to allow for fuel economy of 33.6mpg (8.4l/100km) and emissions of 197g/km, improved by 0.5l/100km and 12g/km. The front-wheel-drive 2.0T now develops 217bhp (220PS/162kW) with a combined fuel economy figure of 37.1mpg (7.6l/100km). Thanks to low resistance tyres, aerodynamic underbody, and a stop-start system, the new engine emits 179g/km, a reduction of 0.5 L/100km and 10g/km. Rüsselsheim. 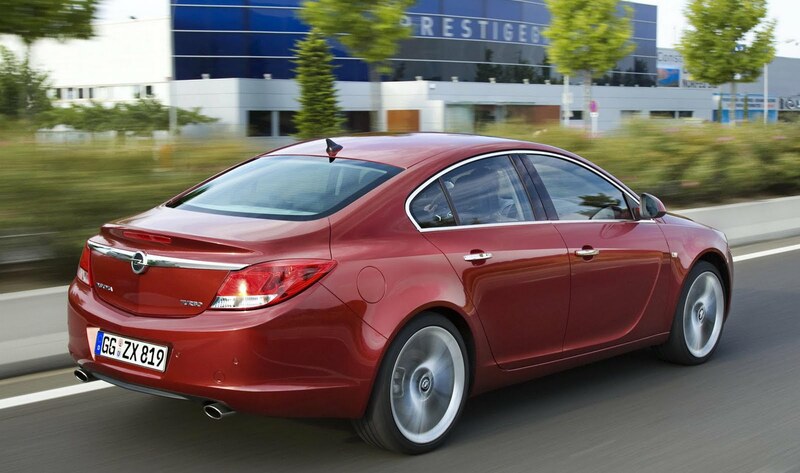 Since making its debut, the Opel Insignia has won more than 50 national and international awards, including the especially prestigious title "Car of the Year". Customers have affirmed this critical success with great demand - over 400,000 units of the brand flagship have been sold to date. 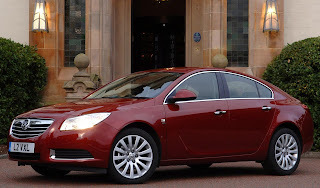 With new gasoline engines and state-of-the-art technologies, the Insignia is set to continue its successful run in model year 2012. Prices start at 23,330 euro (RRP incl. VAT). The newly developed 1.4 turbo ecoFLEX gasoline engine is the product of uncompromising "downsizing". In combination with six-speed manual transmission, Start/Stop technology, power steering, aerodynamic underbody paneling and size 225/50 R 17 low-rolling-resistance tires, it is the most economical gasoline engine in the entire mid-size class segment. All together, these measures reduce the 1.4 turbo fuel consumption - compared with the previous 1.8-liter version, also with 103 kW/140 hp - by two liters in the sedan to 5.7 liters per 100 kilometers. CO2 emissions are reduced by 45 grams to 134 grams per kilometer - in both cases a reduction of more than 25 percent. At the same time, the torque delivered by the most economical gasoline engine in its class was increased by almost 15 percent to 200 Nm. 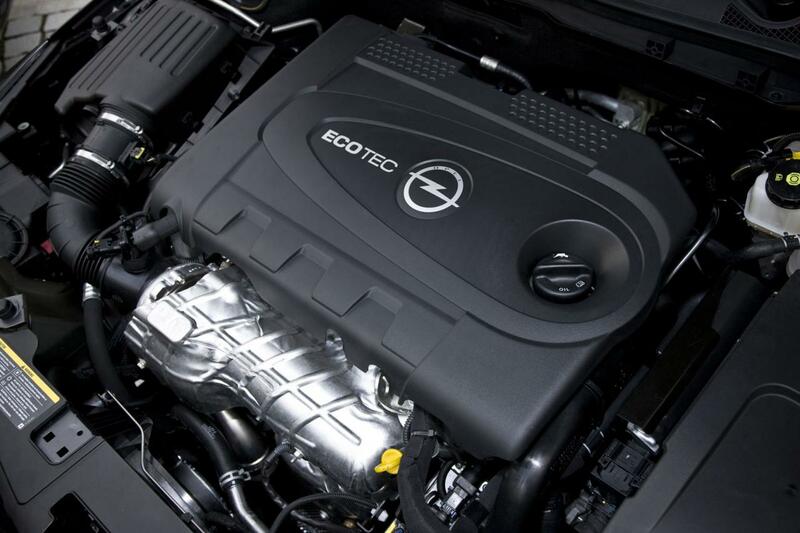 With this performance potential the Insignia 1.4 turbo ecoFLEX can accelerate from zero to 100 km/h in just 10.9 seconds, reaching a maximum speed of 205 km/h. Opel's top model is available with this propulsion variant as a sedan or as a Sports Tourer and - with 5.9 liters per 100 km and 139 g/km CO2 - it also sets standards in the station wagon segment. Refinements to the new powertrain also include the optimization of the transmission ratio, resulting in reduced consumption and improved agility. The electric power steering REPS (Rack Assist Electric Power Steering) featured for the first time in the Insignia provides additional comfort. Its steering characteristics can now be even more flexibly adapted to every driving situation. A significant advantage of the REPS system is the potential for fuel saving and thus a reduction in CO2 emissions. As it does not permanently rely on a running hydraulic servo pump, the electric power steering is only active when it is required. The two-liter turbo with direct injection in combination with the state-of-the-art 4x4 all-wheel drive goes into the new model year with 30 hp higher output. It is available with six-speed manual transmission or automatic transmission. The engine delivers 185 kW/250 hp and maximum torque of 400 Nm (previously 350 Nm). This powerful drivetrain with manual transmission can sprint from zero to 100 km/h in just 7.5 seconds. The top speed is electronically limited to 250 km/h. The 2-liter turbo unit is impressive proof that increased output and reduced fuel consumption can go hand in hand. Thanks to extensive measures like the Start/Stop system and low-rolling-resistance tires, Opel engineers were able to reduce fuel consumption and CO2 emissions to 8.4 l/100 km and 197 g/km respectively (previously: 8.9 l/100 km, 209 g/km CO2). With this increase in power and torque and the even more dynamic characteristics - with simultaneous reduction in fuel consumption - the Insignia 2.0 turbo 4x4 convinces with a top performance in the premium mid-size class segment. Not just the two units already mentioned benefit from the Opel Start/Stop system. The 162 kW/220 hp 2.0 turbo with front-wheel drive and six-speed manual transmission will soon be available with the intelligent fuel-saving technology - including aerodynamic underbody paneling and rolling-resistance-optimized tires. This reduces fuel consumption by 0.5 to 7.6 liters per 100 kilometers. The Start/Stop system is in its element in city traffic, where up to one liter per 100 kilometers can be saved. The CO2 emissions in the combined cycle were reduced accordingly to 179 instead of the former 189 grams per kilometer. The new infotainment systems Navi 600 and Navi 900 Europa are far superior to the CD or DVD-based predecessor versions in terms of the scope of features offered. All of the map material is stored on SD cards, and the maps can be adapted to suit individual customer needs. In addition to the default points of interest (POIs), further POIs can be downloaded and stored on the device. The driver can select single points and store these in the address book as individual POIs. Another practical feature: as well as the fastest and shortest routes, the navigation system also allows the selection of the most economical, i.e. lowest fuel consumption routes. The Navi 900 Europa system also offers a voice recognition and log book function - the latter with the option of separating private and business trips. An additional POI announcement informs the driver of points of interest in the direct proximity by audible signal, text or popup. As of the equipment variant "Edition", an especially high-quality Infinity sound system is also available. 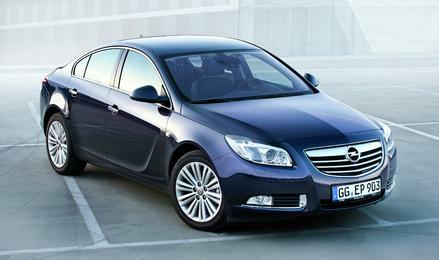 The Opel Insignia also offers further optimizations in the model year 2012 in terms of safety. The new Opel front camera, used for traffic sign recognition and lane departure warning to date, now also has the Following Distance Indication which constantly measures the distance to the car ahead in seconds. It is activated automatically from a speed of 40 km/h and helps the driver to avoid rear-end collisions and possible fines for tailgating. The Forward Collision Alert provides a visual signal on the instrument cluster and an audible alarm to warn the driver of an imminent collision with the car ahead. Additionally, the optionally available front camera in conjunction with AFL+ serves as a High Beam Assist. The model year 2012 Insignia also offers enhanced comfort and additional elegance. It is available on request with premium Nappa leather finish "Indian Night" which is distinguished by a combination of high-quality black leather with contrasting stitching in an elegant Cognac tone. The exterior look is refined by the new dark metallic lacquer "Luxor", which, depending on the light, has blue-violet color reflections. The sporty, elegant silhouette of the Opel Insignia will be rounded off in the coming months by a selection of new alloy wheels with striking rim designs. Alain Visser, Vice President Sales, Marketing and Aftersales at Opel, on the market potential of the optimized Opel Insignia: "With its new product characteristics, particularly regarding fuel consumption and CO2 reductions, the Insignia will strengthen its outstanding position in its class - to the benefit of our customers."